Performers include: Eddie Albert, Eva Gabor, Tom Lester, Frank Cady, Pat Buttram, Alvy Moore, Hank Patterson, Barbara Pepper, Sid Melton, Kay E. Kuter, Mary Grace Canfield, and Edgar Buchanan. 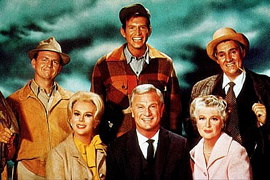 Oliver Wendell Douglas (Eddie Albert) has long dreamt of becoming a farmer so he quits his job as a New York attorney and buys a dilapidated farm in the small town of Hooterville. Oliver can’t wait to start doing chores and breathing fresh air while his beautiful and ditzy wife, Lisa (Eva Gabor), would much rather return to Time Square and her cosmopolitan shopping. The Douglas’ new rural community is populated by a wide variety of eccentric characters like dim-witted farmhand Eb Dawson (Tom Lester); oily salesman Mr. Haney (Pat Buttram); scatterbrained county agent Hank Kimball (Alvy Moore); amiable general store owner Sam Drucker (Frank Cady); quarrelsome and untalented carpenters Alf and Ralph Monroe (Sid Melton and Mary Grace Canfield); elderly farmers Fred and Doris Ziffel (Hank Patterson and Barbara Pepper, later Fran Ryan) and their “son,” Arnold the pig. The series is a spin-off of Petticoat Junction (which also takes place in Hooterville) and The Beverly Hillbillies. Characters from each of the three shows appear on the others. Sam Drucker is a regular character on both Acres and Junction.